Are you really ready to accept the fruit of your labors? Do clients and staff who are passive frustrate you some days? Do you always accept responsibility as you should? Do you find you have courage to lead in today’s times? 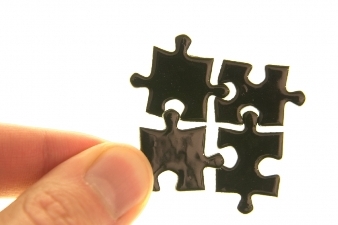 As you read this article, you might wonder what the 4 puzzle pieces are all about and what they have to do with you as a leader or business professional? I will un-package the mystery behind that question, while trying to bring forth a series of insights for you to operate best this year—not just in your business, but in life at-large. First of all, I must admit that the general reality of these concepts came through peer discussion at The Strategic Coach® with one of my associates from Kansas who heard them from what he admitted was an “unknown source.” Our group found the overall concepts so intriguing that we frustrated our friend to repeat them several times. I found myself challenged to take these concepts and expound upon them while adding personal insight. I find that many times that we are too willing to accept passivity from others. It shows up in the workplace when people see a poor work ethic, cheating, lying, stealing—or worse—within their own team, yet do nothing about it. They say nothing, and certainly do not confront their associate about it. This might not seem like a big deal, though I find that if one person accepts passivity (especially of any leadership capacity), it spreads throughout the culture of the organization. If you have even one person on your team that should not be on the bus, you risk irreparable cultural harm to the company and possibly much more. Similarly, in your personal life, you could have a child who doesn’t want to take care of his or her chores, creating not only a poor work ethic, but an extra burden for others in the family. Or it could be the couple that finds themselves taking passivity to another level through passive-aggressive behaviors, as if it is something more desirable than direct communication. And there are many more examples just like these. So my call to you is to reject passivity within yourself and your relationships, and to encourage others around you and in your organization to do the same. Now, this one might seem obvious, but it seems to be a problem in today’s culture more than ever. Too many people at the top are not willing to accept responsibility. The concept of delegation is a prudent one for any successful leader, though with it comes the power to deny responsibility that really should fall on your shoulders. If I am an employee working for you, and I see you shirking responsibility, why should I be expected to do anything different? It is very easy for those in a leadership capacity to not follow-through on things we promised to clients and associates because there might be more reason to believe nobody is going to challenge us on it. After all, we’re busy, and we will get to it when we get to it. The sad part is that we work like we don’t have to be accountable to anyone sometimes, when in reality, everything we do affects the workflow of our entire organization. We are like dump trucks backing-up to our unloading points (i.e. the desks of our employees). In today’s economic climate, we need to start looking at ourselves and asking “where am I not accepting responsibility?” and “in what ways could I change, so I could be a better leader for this organization?” I believe if you wake-up every morning asking these questions, you will find a number of insights and internal challenges that will allow you to be a better leader, every day. So, if you are willing to reject passivity, and you are now more willing to accept responsibility, what is next? It’s a trait that’s not earth shattering in concept, yet it’s become harder and harder to find: “lead courageously.” Permit me a few analogies and examples… Our soldiers defend the freedoms of our nation courageously each day while risking their life, should inspire us to lead courageously in our offices by instilling a voice of clarity, encouragement and respectable life-modeling. And what about the child battling cancer, yet is giving her parent’s a voice of strength when they have lost their own because she still has courage within her little body to face each day? Or how about the person with a physical disability that did things in their life that people said couldn’t be done, but they did so while leading an organization and/or family? Take it from a child that grew up with a courageous father who had a physical disability… it does happen. I am not asking you to wake up each morning to do 20 more chin-ups (Wait.. do you even do chin-ups? J). No, I am not asking you to do one-arm push-ups or run a marathon, either. I am challenging you to look at where you could be more willing to learn, more willing to show our team and families vulnerability and genuine compassion. I am asking you to grow, and to re-dedicate yourself to a life of growth—not merely for your benefit, but for those around us in our circle of influence. If we do that, we not only live a life of deeper meaning, we start an internal shift with-in our organizations and families that will be profound. Here’s something to try… TURN OFF YOUR TV! (Ok, at least the news.) Wake up each day, be glad you did, and go out there focusing on creating your own good news. Let others read and listen to the garbage that is floating around about how the world is coming to an end because of the economy, and a multitude of other reasons. Just focus on leading courageously each and every day. To do so, you need to be “outward focused” in all that you do. Hopefully my application isn’t too hard to draw here. If, for instance, you went the extra mile to help lead a project, were willing to show love to your family through doing the unexpected, or were willing to run your business in a way that proved you had faith and an abundance mentality, then I believe you will see great change. If you have a client that is leaving you after being with you for many years when it doesn’t make sense, or worse, you have a client that will not pay a bill that is clearly due to you, there is one thing you could do that would give you a deep sense of peace and clarity. You could realize that you were not in control of the results anyway, and you could shift your focus on responding in a positive way. The more time you waste chasing them down (or potentially on legal fees), the more it will affect you beyond what you may initially realize. Protecting your internal confidence is a precious thing, trust me on that. So, back to what the 4 puzzle pieces image had to do with this story. The illustration was to show how many times things appear to line up that really don’t. If we are unable to reject passivity, accept responsibility, lead courageously and accept the great reward, we will never be able to see the puzzle pieces that don’t quite fit together, nor will we find the one that replaces the one that doesn’t fit. The fingers are holding the pieces, so don’t expect them to magically snap together… it is going to take some effort, mixed in with the ever-important element of faith. I believe the great reward comes to those that clearly have faith in God as the provider of everything in creation. And yes, that would include you. For those that have some doubt about faith, I will simply say that if you are able to live in a way that puts others before you, are able to allow love and forgiveness to permeate through your business leaderships and personal relationships, you will see the rewards. I am willing to admit I am not in control of the outcome of my life, though I wake up each day asking God to prepare me to be willing to receive the great reward that he has planned for me. I believe you will be rewarded for your faithfulness in the little things that are not overlooked by the master of the universe who I am so thankful to know personally. I help my coaching clients focus on matters like these so they can see their business become more efficient, profitable and scalable, if desired. If you want to find out more about how this could be leveraged in your world, feel free to contact me or call me at: 717-615-2274. You are also welcome to share this article or other resources found on my blog: visionandpassion.wordpress.com with those you care about. Feel free to contact me if you or an associate would like to join my blog or receive this article as a PDF. Posted in Entrepreneurs, Leadership and tagged Entrepreneurial, Leadership, Spiritual / Devotional, Team Building / HR on March 17, 2009 by joesharp. If you need help finding professional writers we can help you. Feel free to contact my team at sales@sharpinnovations.com and we can help connect you. It is our affiliate company that we share office space with – http://www.sharpinnovations.com. I would like to get across my appreciation for your generosity giving support to individuals that need help on your niche. Your special dedication to passing the solution all through turned out to be quite functional and have continuously allowed men and women like me to arrive at their dreams. Your new informative facts signifies this much to me and even more to my peers. With thanks; from everyone of us.